After two decades running the line in Major League Soccer, Greg Barkey has moved away from officiating on the field and will now be imparting his knowledge off of it. 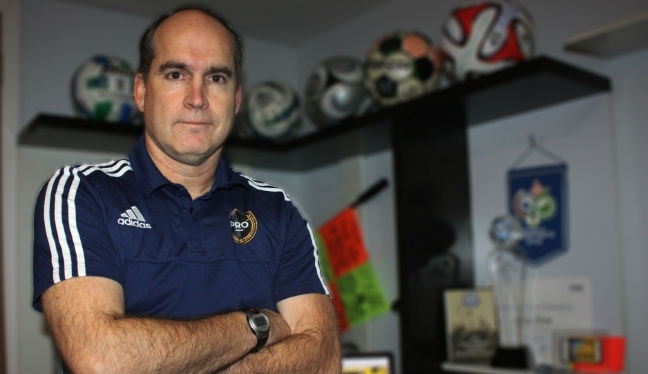 Barkey has been an Assistant Referee in MLS since its formation in 1996, but was appointed to a new role within the Professional Referee Organization back in September – the Manager of Assistant Referees. The 52-year-old admits it was a tough decision to call time on what has been an outstanding career, but the opportunity that presented itself was just too good to turn down. Barkey started in the role the day after the 2015 MLS Cup Final, and is happy with how things are going in the early stages of his new employment. “It was actually bittersweet because it meant that I would no longer be on the field,” Barkey told proreferees.com. “I was planning on going at least one more year and when I was offered the position I realized I only had a few games left, however the possibilities of the new position took the sting out retiring. “I purposely started my new position the day after the MLS Cup Final so there wouldn’t be any conflicts and I could start the new season fresh and with a clean slate. Barkey has been named AR of the Year, officiated at the FIFA World Cup, featured in several MLS Cup Finals and ran the line in well over 300 MLS regular season matches. So how will he impart that experience on to his staff? “With refereeing you are only as good as your last game, which means that you can’t stop learning and improving. I was successful because I felt that there was always a little more I could do,” Barkey continued. “It’s important that the PRO assistant referee buys in to the notion that, to be successful, they need to invest in the training program and techniques that we have learned over the years are most effective. And as for targets? Barkey has a few goals in mind, both short and long-term. “There are a couple of immediate goals I want to accomplish. The first is to set up a communication system whereby the assistant referees will be getting the same information that is being given to the referees. “Second, we will be working on improving the feedback that assistant referees receive after matches from the assessors to make it more intensive, detailed and with positive action plans for improvement. “Finally, before the season starts, we will have a group of specialized assistant referee coaches who will mentor and advise all of the assistants on a regular basis.